Fort Gansevoort presents in-gé-nue the first solo exhibition in New York City featuring the artwork of Austin, Texas-based artist, Deborah Roberts. The show, which opens on November 9 features newly produced works on paper and panel. Roberts’ central concern is the depiction of beauty, especially as it relates to the development of self-image in black women. 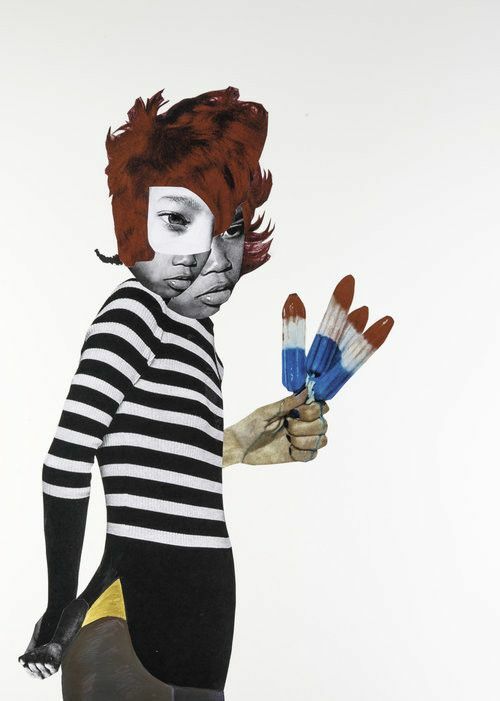 Combining found photographs, painting, and drawing, Roberts’ collages critically engage the image of a young girl, an in-gé-nue, whose naivety and innocence protect her from the full weight of visual culture, while also making her vulnerable to its influence. Her body image is constructed through the visual material produced by art history, popular culture, black culture and American history. Using this visual lexicon, Roberts grapples with notions of blackness, the dysfunctional legacy of color-ism, and the psychology of double consciousness that pervades the African American community. Roberts’ polymorphic figures suggest the multiplicity of black identity. In many of the collages, Roberts’ multilayered faces create images that resist easy consumption. These combined images are made up of different features from many faces in order to undermine the homogenous view of the black body. For Roberts, there is not a clear or singular vision of blackness. One must, therefore, struggle to put the visual pieces of her collages together. Her pictorial field is a zone where power relations are modified and called into question. In the piece entitled, As I am, the figure confronts the viewer with a direct gaze that both seduces and accuses. In addition to the authority of the ‘look’, Roberts often includes disproportionally large fists in her artwork. The fists represent the power structure, namely, the acquisition and assertion of power. In an artwork entitled, The Harvest, the figure’s large fist confronts the viewer. Here, she is challenging the brute force of popular culture and visual history on the bodies and minds of little black girls. Through her process of reassembling, Roberts reclaims power over the images that seep into black women’s self-perception at young impressionable ages. In addition to the collages, the exhibition includes a series of hand-painted serigraphs featuring the names of what one may consider to be stereotypical ‘black’ sounding names. Along with the collaged figure, Roberts is curious about naming and the affect it has as an image to preconceive – as well as reveal and conceal the self. This show is a timely contribution in a moment when the embodiment of race, gender and a number of identity positions are under revision. Roberts asks us to think not only about the history of representation, but also about the present ways images function to reform previously limited scopes of beauty, and the implications that these expanded definitions have on future generations of young black women.